Tomorrow is Glitter Me Up Friday so I thought I better post last weeks GMUF nails before then. Yep I painted my nails and photographed them last Friday but then I collapsed before I got to blog them. I've been sick for a few weeks and it gets worse at night which is my usual blogging time (after the kids are in bed) so I've been really slack. I actually had naked nails for most of last week! It's really hard to paint my nails when I have to keep blowing my nose. Tissue isn't very nice stuck to nails. Oh hang on maybe I could start a new trend like those flocked nails. Tissue top coats! You'll never need to carry a hanky again :) hehehe imagine that over a green glow-in-the-dark polish. Anyway.... the recent introduction of new Picture Polish Mesh shades had me itching to wear my old favourite mesh again so last Friday I painted my nails with Picture Polish Jealousy. 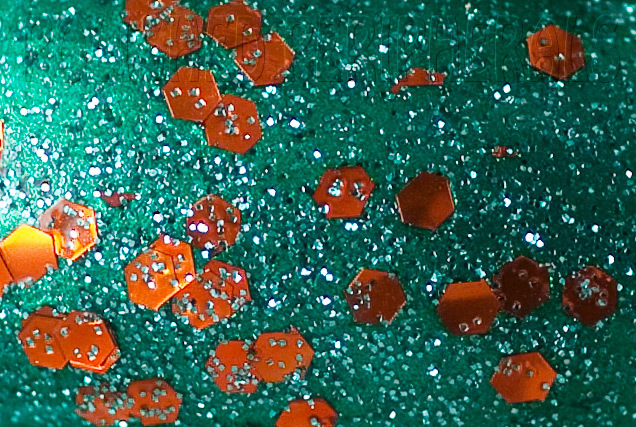 Jealousy is a really dense mesh of green glitters in a grass green base. The base is nicely pigmented and the glitter is thick but smooth to apply and it dries surprisingly smooth for such a packed glitter. Then, because I'd recently received a pretty fabulous swap package, I added a thin coat of OPI Black Spotted for some snake skin nails. Black Spotted is a lot of fun. I've tried it over so many different polishes including colour change and glow-in-the-dark and it looks great. It's really easy to use, just a thin coat works best. I got it a bit too thick here because I was working slowly (without my glasses) trying to cover all the edges of Jealousy. It turned out best on my left thumb. Picture Polish Jealousy is available from www.picturepolish.com.au or one of their International Network Members. I have no idea where you can get OPI Black Spotted from other than swaps and group buys, I don't know if it will ever be available here. Happy Glitter Me Up Friday! OK so it's Saturday and it's almost over but I've finally decided to share these pics. I was so disappointed with my manicure and photos yesterday that I wasn't going to blog them but I didn't have time to redo anything. I made a mess of this and the photos really don't do the polish justice, but I can't let GMUF go by without showing some glitter. This is When Planets Collide from Emily de Molly, another great Aussie indie brand. I have three Emily de Molly polishes and couldn't decide which to feature for GMUF so I let my husband choose. Obviously he chose this. When Planets Collide is a sheer black jelly with blue, turquoise and orange glitter. 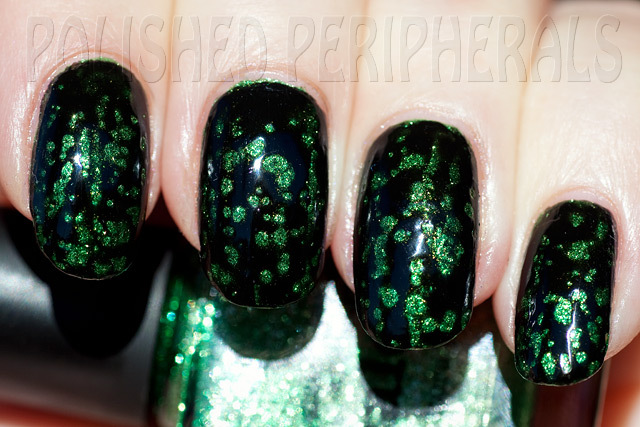 It becomes almost opaque with 3 coats and I love the look of the glitter suspended in the jelly. For this manicure though I decided to layer it over a dark base. I thought it would be quicker than 3 coats and make the glitter stand out more. I stuffed up though and used a dark grey base rather than a simple black. The grey wasn't dark enough and showed through the black jelly so I ended up using three thick coats of When Planets Collide to try and cover up the grey. I was in a hurry though so I added the third coat before the second was dry and then because the kids needed help with something I slapped on a thick fast dry top coat thinking that would set it all. It didn't, it bubbled and I dinged two nails before I could take photos. Then I tried quick dry drops and while rubbing the excess oil off, the polish started sliding off. So I quickly took some photos. There was no sun so I took them indoors with flash and I'm not happy with them. I really stuffed this :( Such a waste of a beautiful polish. The name is perfect for this, it looks like a mini galaxy of planets. Next time I'm going to either use a black base or none and I'll make sure the kids are out of the way so I can let each layer dry properly. After I'd taken photos I wiped this lot off. Literally wiped it off, with my fingers and no polish remover. Total fail! Emily de Molly polishes are available from her etsy store Emily de Molly etsy store. She ships quickly and her polishes are beautiful. Don't let my mess put you off. I promise to do better next time. Oh and it looks like I've received a few blog awards, or the same one a few times over. Thanks girls I'm honoured and a little stunned. I'll have to have a look and work out what I have to do, just as soon as I get some quiet time without the flu that's been bugging the whole family since Thursday. Does anyone else find it hard to think with other people around? Hubby has been home sick since Thursday and so was the 7yo. This is my last day for the Great Aussie Polish Challenge. It should have been yesterday but by the time I got home from dinner at my parents and painted my nails it was midnight and I couldn't stay awake any longer. Dragging this out over two days did give me the chance to get some daylight photos though. I took photos last night with the flash before bed then got up this morning, added a top coat and ran outside to get some sunny photos. This polish deserves sun! This is Le Beauty & Nails Supplies #192. Sorry it has no name, which is really a shame because it deserves a name. 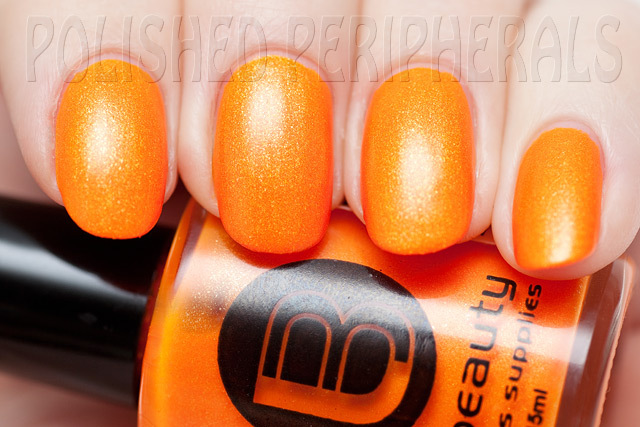 It's a stunning neon orange with a gorgeous fine glass fleck shimmer. This is three coats, no top coat, taken indoors at night with flash. I have a few Le Beauty polishes (all without names) and I'm quite impressed with them all, but this one I love. It makes me gasp with the first brush stroke each time I use it. Which is weird because I'm not usually a big orange fan, or I wasn't until I met this orange. I can't help myself, this one just draws me in. It's such an impressive colour and the shimmer gives it added depth. The best thing is it dries to a silky smooth matte finish. Not at all dry or rough, just smoooooooth. The sort of smooth I can't help but keep rubbing my fingers over. See that shine, that's all down to the shimmer, not a glossy finish. I didn't even use any hand cream or cuticle oil before I took these photos because I didn't want spoil the look of that finish. I like to admire the matte finish for a day or so and then add a glossy top coat. The top coat isn't just shiny, it adds depth. So the rest of the photos are outdoors with a top coat. Not a thick top coat. I used Essie To Dry For. 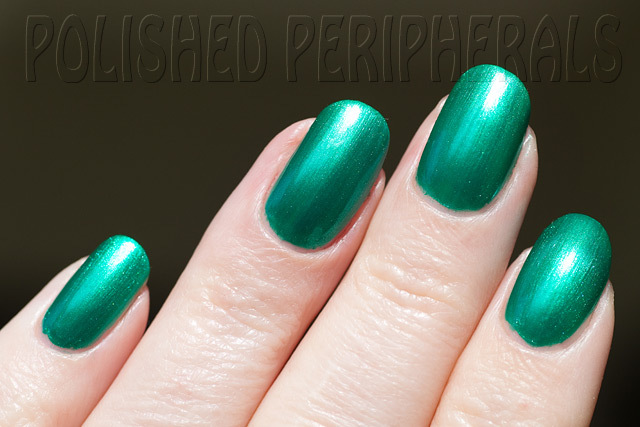 A thicker top coat like Seche Vite would add even more glassy depth. What do you think? It's amazing isn't it? Le Beauty & Nail Supplies polishes are available from http://www.lebeauty.com.au They sell other brands as well but this is their own brand. There's a large range of colours and they are very nicely priced at just $3.18 AU. I haven't seen many swatches around so it's a bit of a guess as to how they will look on but I haven't been disappointed with any of my Le Beauty polishes. So that's it for Aussie Polish week. I hope you've enjoyed seeing some of our home grown brands. I think we have an amazing range to choose from. 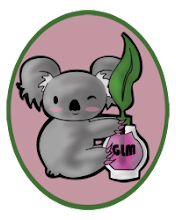 There's still a lot of brands I haven't blogged, some of them have been covered by the other girls but I think I'll try and include an Aussie brand each week now. I pulled out a lot of old favourites whilst deciding on polishes for this week that I can't wait to wear again. Here's the rest of the Great Aussie Polish Challenge girls. Bright Lights, Pink City is a sheer jelly. I used 4 coats for this coverage and there's still visible nail line. If my nails were shorter 3 coats would probably be enough. It's a very pretty, almost neon, Barbie pink with a gorgeous gold shimmer. It was quite a thin runny formula but was easy to control and dried smooth and shiny. These photos are without any clean up or top coat. I've read some other blogger's complaints about the drying time for the Barbados polishes but I didn't have any problems at all with this. It actually seemed to dry quickly. I applied all 4 coats while I had my lunch then got the washing in without any need for a quick dry top coat. Good thing it dried quickly or I would have given up before 4 coats. I also tried it over black to see if the dark base would bring out the gold shimmer more. It did but the pink was a streaky mess over black, not really sheer enough for that trick. I think Barbados was supposed to be a limited edition collection but I still see them around on the shelves at Big W. It's worth grabbing them if you come across them. Today for The Great Aussie Polish Challenge I have something stunning from Pretty Serious Cosmetics. This is BSOD from the Hello World collection, a set of six computer themed polishes with matching eye shadows and lip glosses. It's a wonderfully pigmented collection, full of sparkle, with clever names. BSOD means blue screen of death, something the computers around here are prone to, particularly my 7yo sons old machine. Kind of appropriate that I'm wearing this today considering my husband picked up the parts (most of) for my new computer today and is currently installing the motherboard. I don't get a lot of BSODs but my computer struggles to keep up with my Photoshop work so I'm getting a new machine, my husband will get my old PC and pass his on the the 7yo and the 7yo will pass his down to the 3yo. The 3yo has a very nice laptop which actually runs better than the 7yo's PC but he wants what his brother has so he'll be thrilled to get the old king of BSODs. All of which has nothing to do with this polish besides the name. This BSOD does not make me want to throw things at my screen. 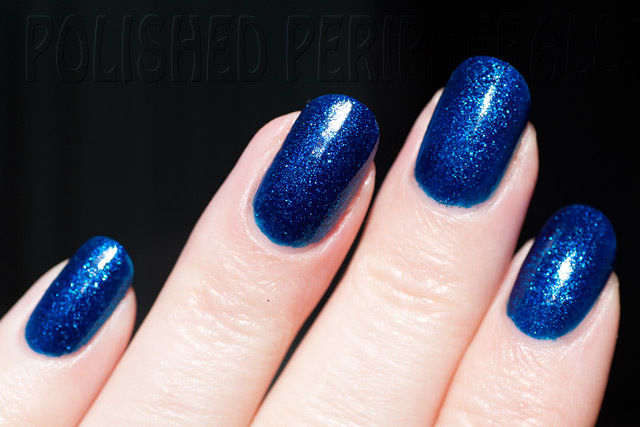 It makes me drool :) It's a luscious blue jelly full of blue glitter. This is 3 coats, no top coat. It just glows with the glitter shining through all the layers of jelly! Look how pale my skin is! Pretty Serious Cosmetics is one of the newest Australia brands, created by one of our Aussie bloggers, Kaz from Pretty Random. It was so exciting watching and waiting as she worked up to her store opening and now there's a new range coming and the teaser photos have me on the edge of my seat again. Pretty Serious Cosmetics polishes are vegan, cruelty-free, big 3-free and formaldehyde resin free. Available from http://www.pretty-serious.com with international shipping options. Next up on The Great Aussie Polish Challenge I have the Ozotic brand. Ozotic make the most beautiful multichromes, duochromes, and holographics. Unfortunately they are discontinuing the 500 series which are multichromes, linear holos, the Elytra glitters and the Mish Mash range, which are holographic multichromes. There's still some colours left in the Goodbye Shades section at piCture pOlish if you're quick (and they're reduced too). Of course the Ozotic 600 and 700 series will still be available but it's the 500s that seem to be the most loved, two of which I'm showing you today. This is Ozotic 526, it's a black holo and it's still available in the Goodbye Shades here. I had trouble photographing the holographic effect on my nails. In real life it was blazing rainbows in the sun. Like the bottle. This is just one coat, no top coat! What more could you want, a one coat black with holo :) All the Ozotics I've tried have been smooth and easy to apply, pretty much a perfect formula. Then because I already had a black base I decided to layer it with Ozotic 503 (sorry I think this one is all sold out). The multichromes are quite sheer and designed to be warn over a black or dark base. I usually prefer to use a dark colour similar to the base colour of the multichrome, in this case it would be green, only because I don't like the look of black edges around my multichromes and I rarely paint well enough to hide the edges. 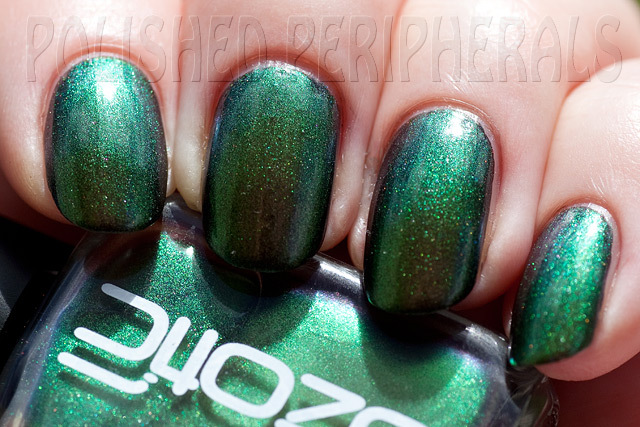 Ozotic 503 shifts from coppery pink to a rich emerald green. In between there's shades of bronze, olive green and some blue and purple at extreme angles. It's quite amazing and it's the green that I love. I took rather a lot of photos to try and catch all the colour changes. A most unflattering angle but you can see the blue and purple starting to appear at this angle. I stood with my nails out in front of the camera and spun in a circle to catch the light from all angles. Then I made a quick animated gif from the pics. It's my first attempt at this so it's rough.